Two years ago, I ran my first race. 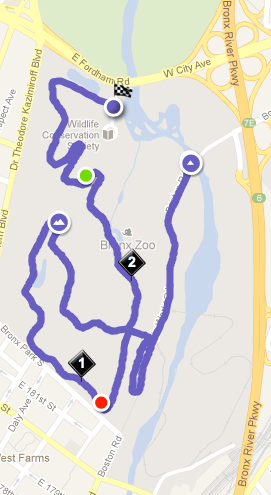 A 5K through the roads of the Bronx Zoo in order to raise money for tigers in the wild. 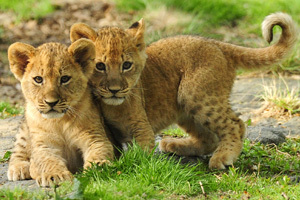 I returned for the third time to run the Bronx Zoo again and raise money for lions. This year, my nephew wanted to run the Bronx Zoo, like he did last year. Unfortunately, my mother forgot her cellphone, which made meeting up with the two of them a problem. Since I was looking for them, I started at the back of the race and had to contend with the slower runners who clogged the narrow roadways in the first quarter mile of the race. I found my mother and nephew walking the course and my nephew began running with me. We ran together for most of the first mile, until we reached the first big hill. Knowing he would be safe, since it was a very closed course and my mother was somewhere behind him, I kept running and waited for him at the finish line. Because I got such a poor start due to the enclosed road and slower runners, my time was 25:59, which unfortunately was down from my 24:17 from the previous year. My nephew did it in approximately 40 minutes, which meant he was down from the prior year, but he didn’t have someone running with him to keep pace with for the entire 5K. I also did my annual April Detox to prepare for the 5K and get myself in shape for upcoming races this year. After a month of training and dieting, I lost 11 pounds and got myself back into shape for the upcoming Brooklyn Half Marathon and the other races I will be running for the rest of 2012, including a return to the NYC Marathon. The Bronx Zoo Run for the Wild is usually a fun race and fun to run with my nephew. It’s a great start to my running season and can’t wait to hit the road again as I begin my road to the marathon.